Pizza is everybody’s favorite including my princess. If you ask her what you want for dinner, her answer will be pizza or pasta. Until my marriage I used to eat only frozen pizzas. After marriage I found a pizza loving hubby, and when we are staying in Utah there was a 5 dollar pizza joint, hubby buy pizza from every alternate weekend. Once we moved to Houston, we have lot of pizza places nearby, our neighbor is “Pappa John’s, and if I take a 2 minute drive I will reach Pizza hut, then there is Cicis pizza, Dominos pizza etc. If you ask me which pizza do you like the best I will vote for “Papa john’s followed by Cicis’s cheese pizza. I found Pizza hut’s pizza salty to my taste buds. I haven’t tried Domino’s pizza yet. Hubby tells me it is okay. I will try one day and let you know. My order of pizza is always a veggie pizza with tomato, onion, capsicum, mushroom and black olive substituted with pineapple. For my princess birthday we had cheese pizza, pepperoni and veggie, and among the adults pepperoni was a hit. Of course I did not make it, but Papa John did it. So for this month baking partner challenge, we decide to try pizza. 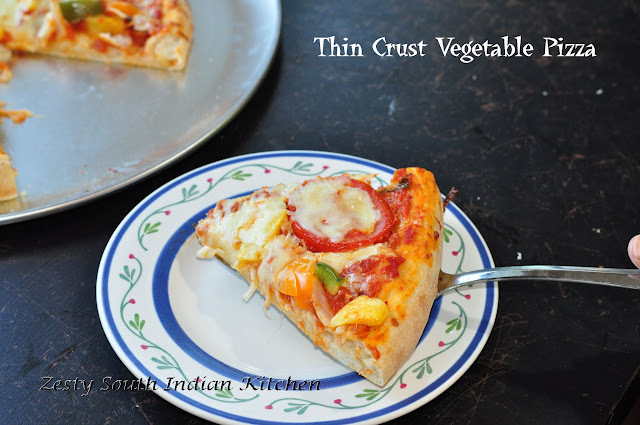 Pam of Living Rancho Deluxe, Archana of Tangy Minds and Priya of Ennveetu Kitchen suggested three recipes of New York style Thin crust Pizza. 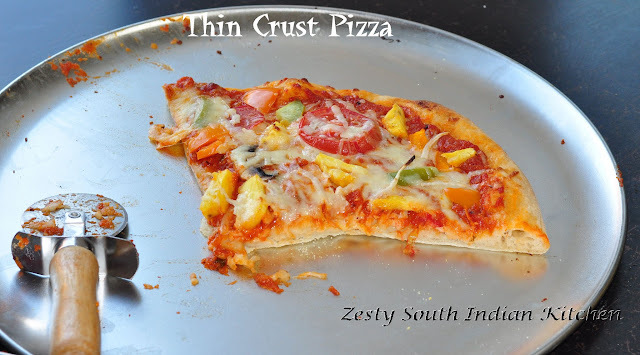 You will be amazed to see the regional variation of pizza available in US, around 30 varieties; you want to take a look at it peek here. Traditional New York style is thin crust pizza with few toppings, however I didn’t followed that rule, I added few of my favorite ingredients. I got lucky with my creation the third time, first time instead of thin pizza I made thick pizza, more like Chicago style. Second time I got thin pizza however it was on the crispy side. Then I started researching what went wrong with my pizza. In the mean time I got this book Flour Water Salt Yeast by from Ken Forkish and trust me it has excellent pizza section in the book. Which explain how to get a homemade oven to work best for making the pizza? I tried his oven techniques, and the pizza that turned out is best. First two times I tried Pam’s suggest pizza recipe. Third time I tried Archana’s suggested recipe . While trying I learnt lot of nuke and corner of pizza making. Still I didn’t figure it yet. One day I will be going to try the flipping of pizza dough in the air (may be in dream). Third time I also bought a steel pizza pan from Wal-Mart. I baked my pizza on pizza stone with this pan on it as I don’t have pizza peeler in hand, and was afraid of losing all my topping without peel. I found bread flour tasted really great compared to all purpose flour pizza. Traditionally pizza’s is baked with Caputo 00 flour, however it is not available in the local grocery store; and you need to mail order them. I may buy it next time and try. Next task in this challenge was to make a homemade pizza sauce, for first two pizza trials I used fresh tomatoes to make the sauce, they tasted okay but lacked the characteristic red color. So for the third attempt I used canned whole tomato which gave me red colored sauce. I also added few spices in pizza sauce. So my preference for making homemade pizza sauce is to go for canned tomatoes, which will also help you from blanching and peeling the skin of tomatoes. There is a You Tube video link on the first recipe about how to stretch the pizza dough, and I tried the technique, and unfortunately I was able to cover only 15% of what he shown in the video. He does it very flawlessly. But I couldn’t finish that. I also read that to increase the flavor you can brush the pizza dough with olive oil before brushing with tomato sauce. I used both freshly grated mozzarella as well as shredded mozzarella cheese as suggested in the Flour water Salt Yeast book. I sprinkled the top of pizza with little parmesan cheese. You can’t make this pizza same day as it require slow fermentation, best will be make the dough today and bake it after 72 hours. I made the pizza dough on Friday evening and baked the pizza on the Sunday evening, taste tester number one my princess who approved it immediately. Then my hubby who said it is delicious. It may look laborious but you will get delicious pizza in the end. Wait is always worth it. · 1 (28-ounce) can whole peeled tomatoes or Fresh Tomatoes. · Any sliced or chopped veggies of your choice such as capsicum, sliced onions, mushroom, also you can add paneer or sliced jalapenos or even fruit such as pineapple. · Any Meat as you like. Preferable pre-cooked Chicken pieces if you want. It is optional. · 1 to 2 cups depends on the size of the pizza – Parmesan or Mozzarella Cheese grated as you like to choose. 1. Pulse the tomatoes and their juice in food processor / Blender until pureed, or puree with hand blender. Puree should not be completely smooth, but should have no chunks larger than 1/16 of an inch. Set tomatoes aside. 2. Puree the onion and garlic and set aside. 2. Combine butter and oil in medium saucepan and heat over medium-low heat until butter is melted. Add onion puree and oregano, marjoram, pizza seasoning, and large pinch salt and cook, stirring frequently, until fragrant but not browned, about 3 minutes. Add tomatoes, basil sprigs and sugar. Bring to a simmer, reduce heat to lowest setting (bubbles should barely be breaking the surface), and cook, stirring occasionally, until reduced by 1/2, about 1 hour. Add salt to taste. Allow to cool and store in covered container in the refrigerator for up to 2 weeks. 1. Combine flour, sugar, salt, and yeast in bowl of food processor or in a bowl. Pulse 3 to 4 times until incorporated if you have food processor. Otherwise mix well together with the help of the whisk. Add olive oil and water. Run food processor until mixture forms ball that rides around the bowl above the blade, about 15 seconds. Continue processing 15 seconds longer. You can mix the dough with hand or in stand mixer to form soft dough. 2. Transfer dough ball to lightly floured surface and knead once or twice by hand until smooth ball is formed. Place the dough in a plastic container and keep it in refrigerator and allow to rise at least one day, and up to 5. I rest the dough for about 72 hours. 3. At least two hours before baking, remove dough from refrigerator and shape into balls by gathering dough towards bottom and pinching shut. Flour well and place each one in a separate medium mixing bowl. Cover tightly with plastic wrap and allow rising at warm room temperature until roughly doubled in volume. 4. Preheat oven to 525°F for 30 minutes with pizza stone inside. 5. Turn the dough ball out onto lightly flour surface. Gently press out dough into rough 8-inch circle, leaving outer 1-inch higher than the rest. Gently stretch dough by draping over knuckles into a 12 to 14-inch circle about 1/4-inch thick. Transfer to pizza pan. 6. Change the oven setting to broil for about 5 minutes. 7. Switch the oven back to bake at 525F. 8. Load the pizza into the oven and bake for about 5 minutes. 9. Switch oven to broil and bake for 2 to 3 minutes, keeping a close eye on it, until the pizza is done. (It took 5 minutes in oven) . 10. Transfer to cutting board, slice, and serve immediately. Very well explained as always. Beautiful. Love the clicks too !!! Good morning from Valencia Swathi. Your pizza looks very tasty. It has been a good experience to bake this pizza crust. It’s a bit different and I didn’t know the tip of adding oil before the sauce. I’ll repeat to bake this recipe again with other toppings. Cheers! Wow pizza looks so inviting, drooling here. 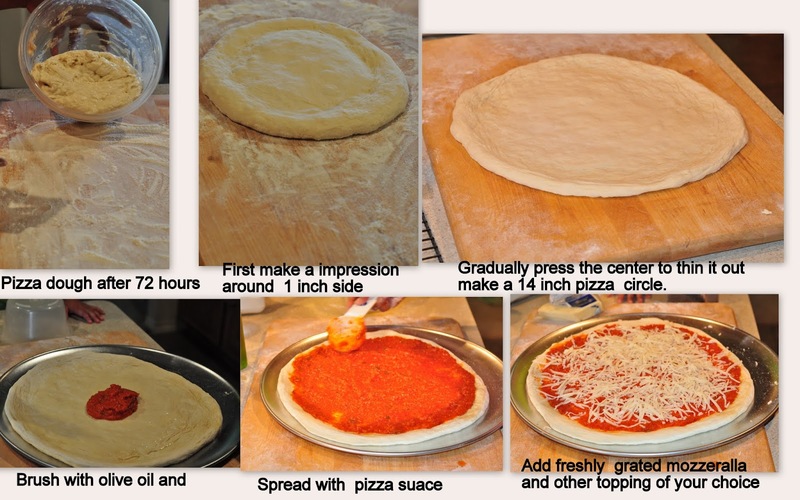 Perfect delicious Pizza with step by step Pics.Will definitely try. I have a fear of baking breads and pizza bases! Give me a regular dish to cook any day, but when it comes to these things, I almost never try coz I am so afraid of it failing! So kudos to you… the pizza looks fab!! 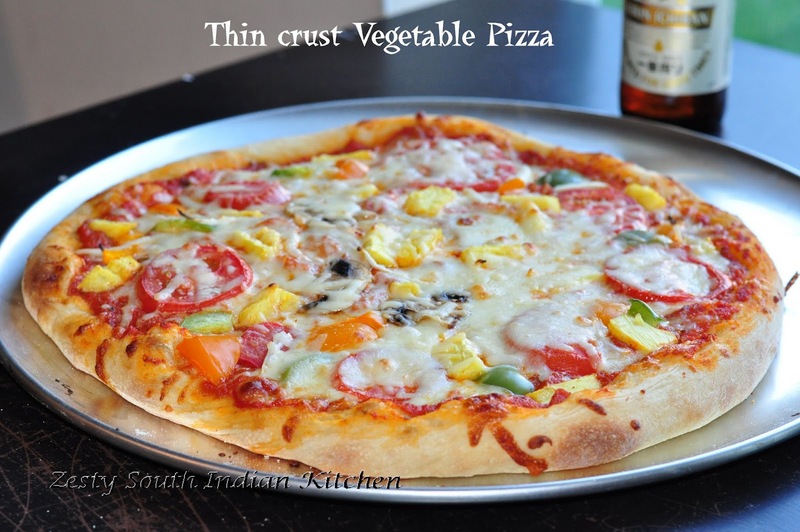 Very helpful post for a perfect pizza.Swathi thanks for the challenge. Yummy Pizza looks so tempting. 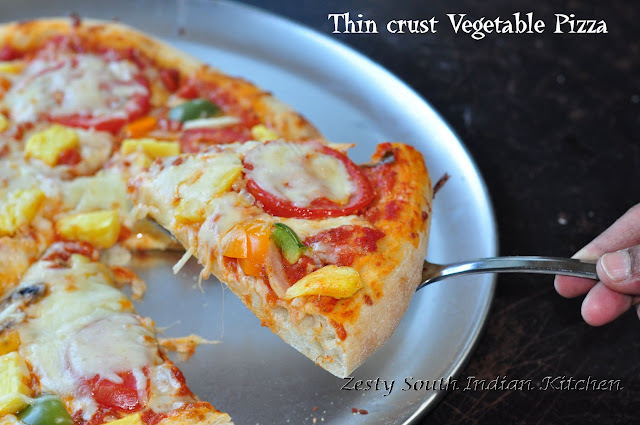 So perfect pizza u made Swathi. Just fabulous! Yummy pizza, Swathi! Love the healthy toppings! Swathi drool worthy,perfectly made and colorful pizza,dough undu,will try this tomorrow 🙂 Thanks for the challenge dear,enjoyed baking. YUM YUM YUM! Looks fantastic. YUM YUM YUM – that looks fantastic! Oh this does look like a delicious pizza! I started making my own pizza dough last year, but haven’t perfected the dough recipe so I’m looking forward to trying yours. This looks like a great Sunday night dinner! Try MJ and Let me know. Love the step by step pics Swathi … thanks for a wonderful pick for this month!!! I had fun making the pizza! Beautiful looking pixza Swathi, crsut looks crunchy and thin. loved the toppings. The Pizza looks so so Yum and very true that Pizza making at home is so much fun!! 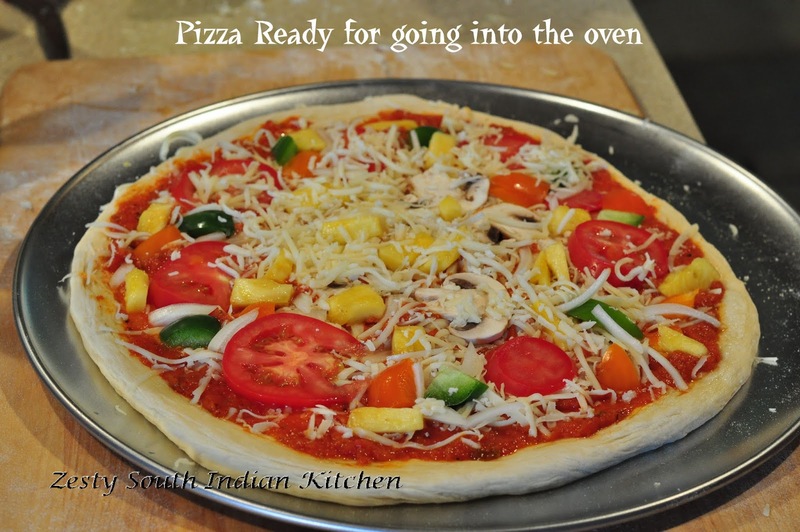 the pizza looks so great Swathi. I’ll try your temperature settings next time. probably that’ll keep my cheese from browning as much. Yes try that , high heat and low time, that is key. Thanks Swathi, an encouragement to bake pizza from scratch again. I used to do it quite a bit, whenever I baked bread, just made a bit extra for the pizza. Now I want to try your version. Glad Clauida I made you to start again making pizza. That is a perfectly made pizza!! Homemade pizzas are all the more tasty and drool worthy. Love the exotic color!! I love the addition of pineapple!! 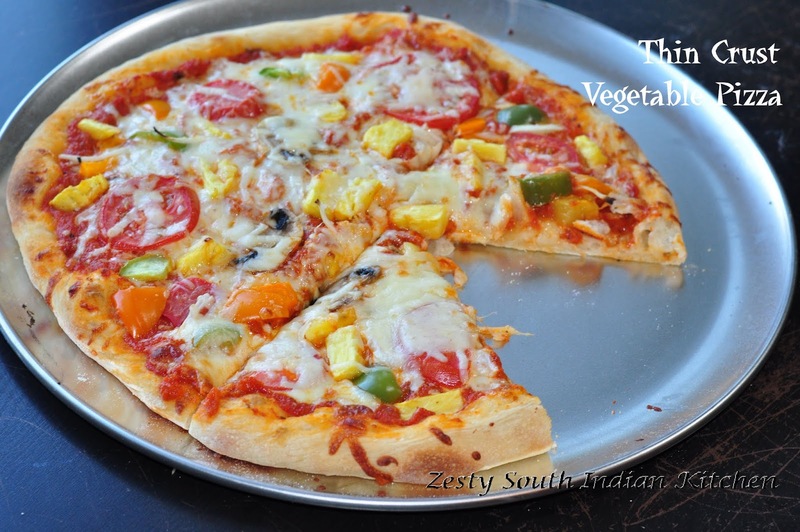 What a delicious looking pizza, Swathi! Vegetarian pizzas are always my favourite. I really like how you can make the dough ahead of time, and then cook it a few days later. You are my great friend, thanks Recbecaa. Wonderful pizza. I like this pizza very much. I definitely want a slice Swathi! Mouth-watering with all those different toppings! I always go for veggies too – love olives on mine too. Thanks for all the great tips! Must taste great after 3 days of aging the dough.